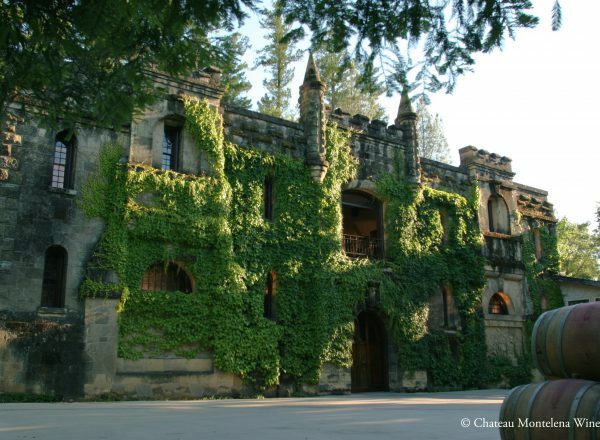 Jim Barrett’s dream of Chateau Montelena was that this wine, their flagship Cabernet Sauvignon, achieve the balance and complexity of flavors, aromas and textures to be considered among the great examples of Cabernet in the world. 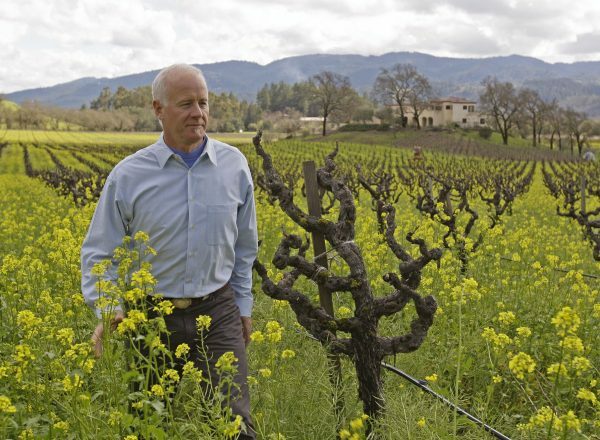 Almost since his first vintages in the 1970s, this wine has been a show-stopper that has everything in place, while revealing the majesty and distinctive character of the estate vineyard site in the northern Napa area that the Barretts led to recognition as its own appellation, Calistoga. 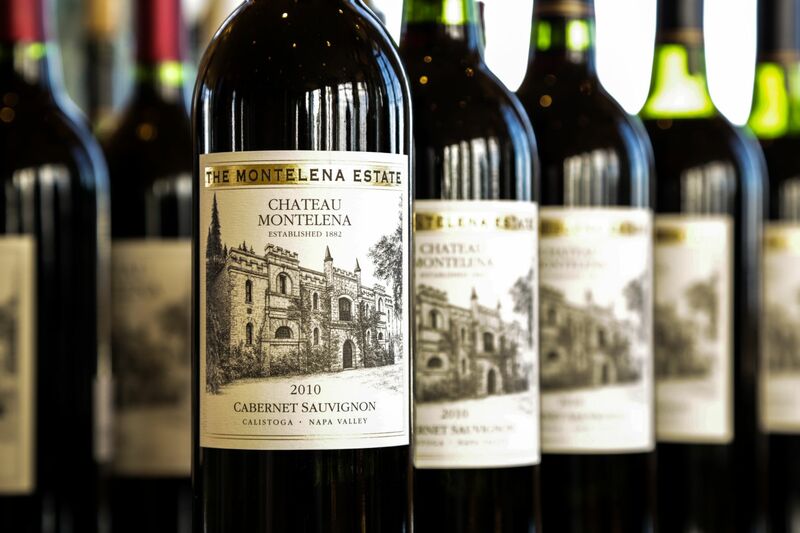 Today, the 50-year legacy of excellence in farming, crafting and blending powerful wines and continued innovation and attention to detail is what sets Chateau Montelena Winery apart. 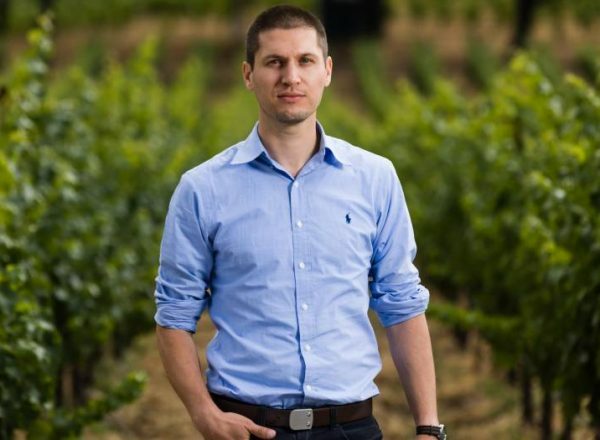 This wine is 100% made with estate fruit. 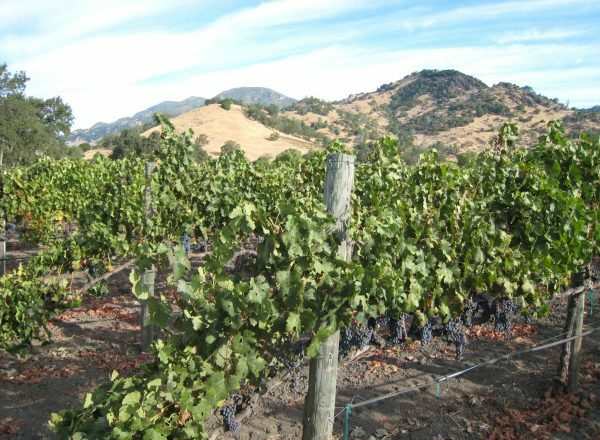 The diversity of soils and slopes where this is grown in Calistoga directly translates to layers of complexity and depth in the glass. The Estate vineyard is comprised of varied terrain, from flat to steep hillsides. 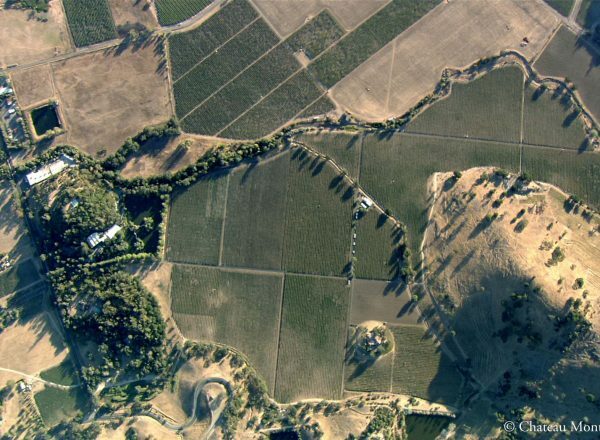 The vineyard gently slopes downward towards its base, where a small patch of sedimentary soil was deposited by the settling of an ancient ocean or lake. 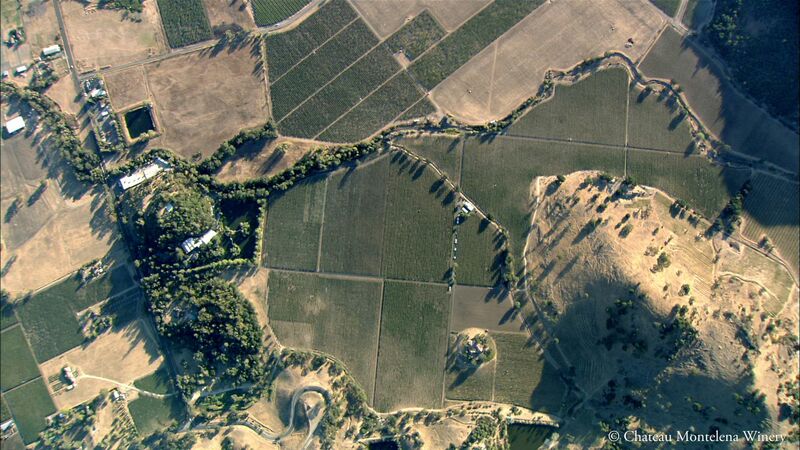 Extending out from the Napa River is the alluvial soil, the most prevalent type on the property. 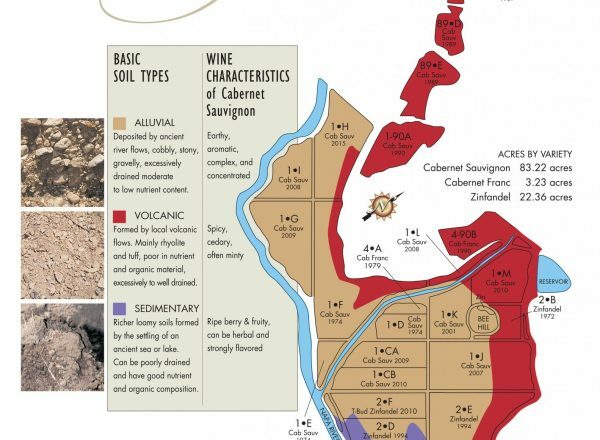 In the back and outside areas of the vineyard are volcanic soils, formed by ancient lava flows caused by tectonic uplifting. 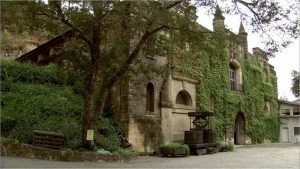 The wine is made up of 97% Cabernet Sauvignon, 2% Cabernet Franc and 1% Petit Verdot. 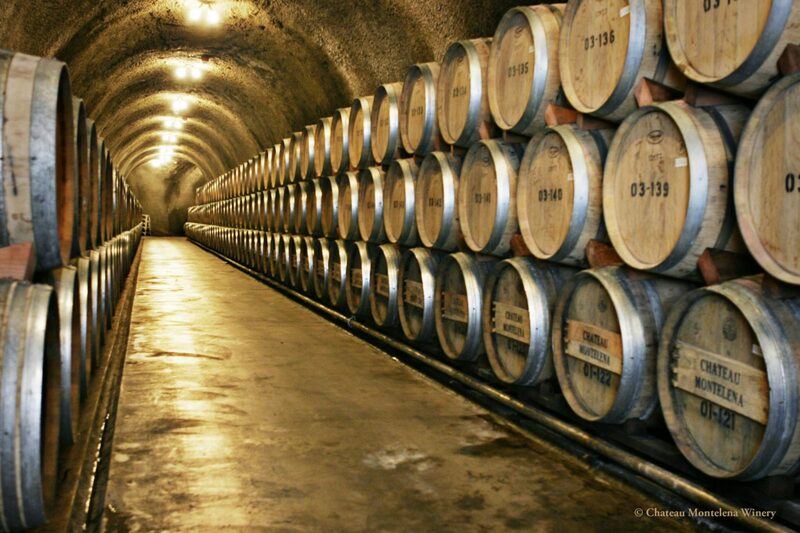 The wine is aged in 100% French oak barrels (40% new) for 22 months. 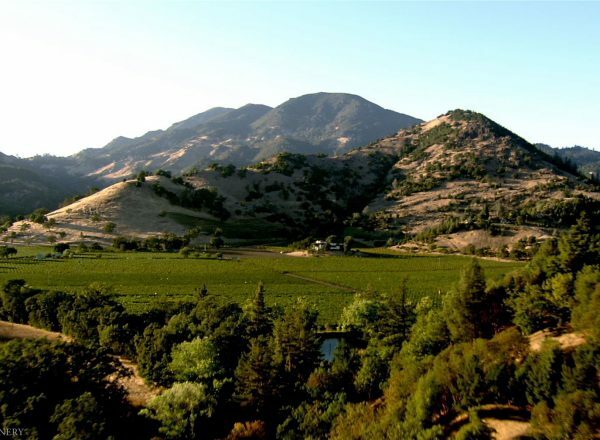 It exuberantly reflects the Calistoga vineyard, while balancing power with an extraordinary ability to age. A relatively warm overall vintage. Bud break occurred early again in 2015 which equals an early start. 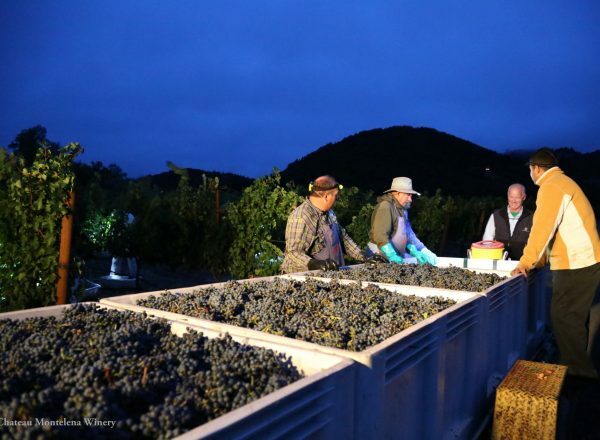 The temperatures remained mild during the summer and the harvest began on September 13th. 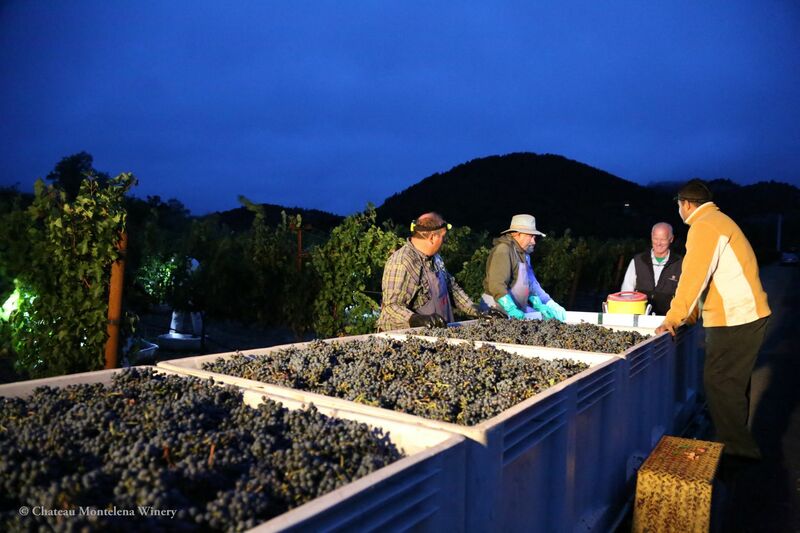 The harvest was small and exceptional in Calistoga. Powerful and intense. 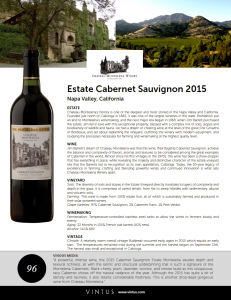 The 2015 vintage is a showstopper that exudes depth and textural richness. 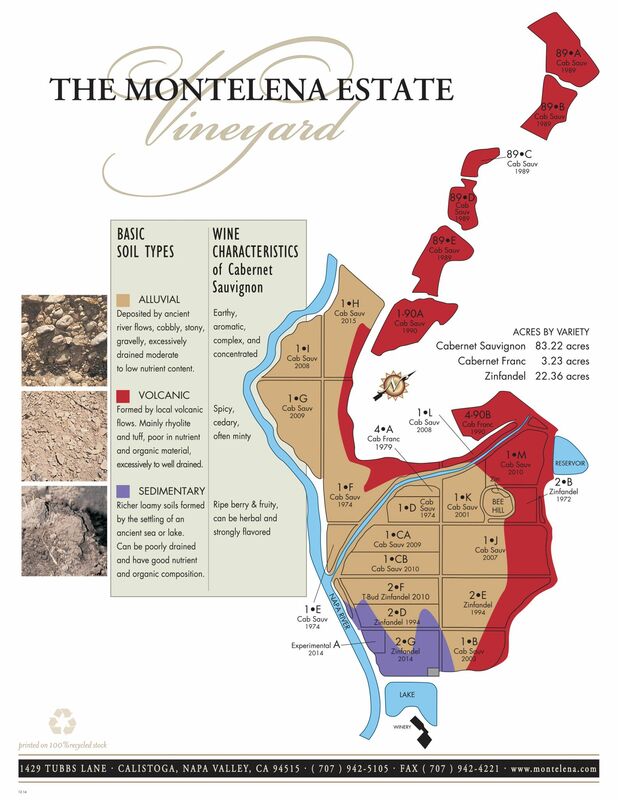 The wine has the old world structure we expect of Montelena, with a nice interplay of silky, fine-grain tannins. On the nose, we get black cherry, plum, lavender and licorice. There are many layers as it builds with a smokiness and flavors of cocoa, spice and blackberry. Racy, fresh and ripe with acidity. 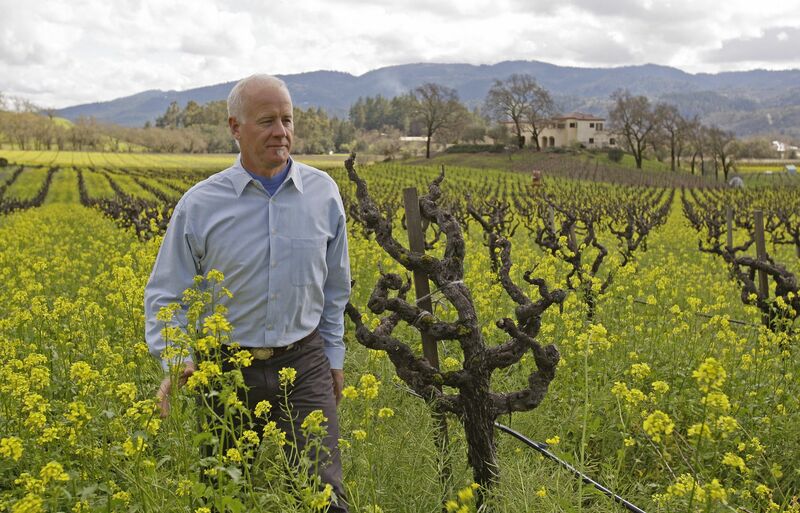 Winemaker Matt Crafton really captures the essence of the terroir with this stunning wine. 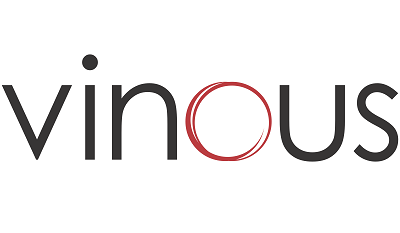 This is a powerhouse wine that can stand up to any number of complex dishes, but can be best enjoyed with beef, lamb, game (deer, venison) and mature, hard cheeses. Jeb Dunnuck - "The 2015 Cabernet Sauvignon Estate is a brilliant wine and one of the gems out there from this estate. 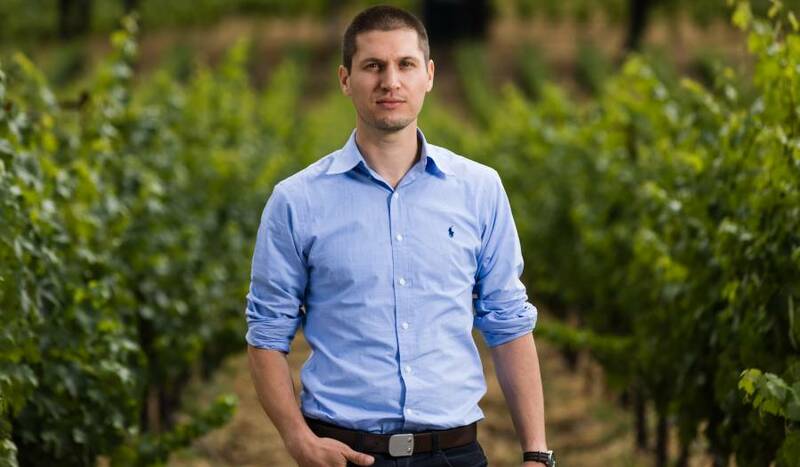 It offers crème de cassis, crushed violets, purple iris, and white flowers, with beautifully integrated background oak. 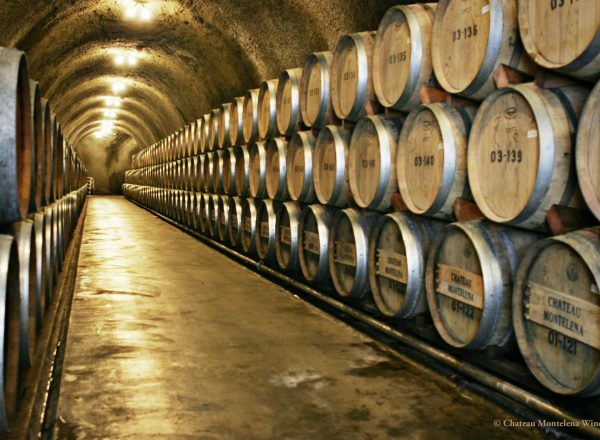 It’s deep, rich, medium to full-bodied, and seamless, with fine tannins, truly brilliant purity of fruit, and a great, great finish." 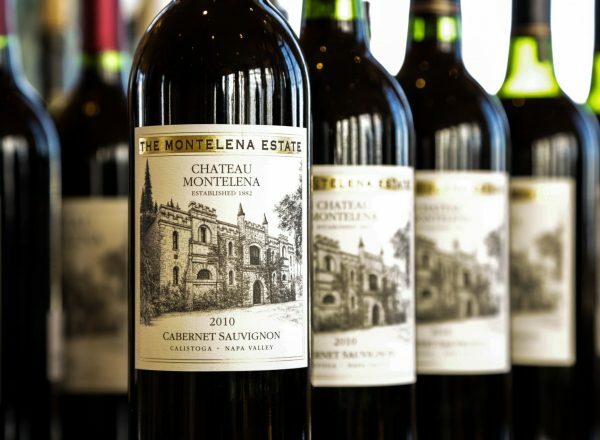 Vinous Media - "A powerful, intense wine, the 2015 Cabernet Sauvignon Estate Montelena exudes depth and textural richness, all with the tannic and structural underpinning that is such a signature of the Montelena Cabernets. Black cherry, plum, lavender, licorice, and smoke build as this voluptuous, racy Cabernet shows off the natural radiance of the year. Although the 2015 has quite a bit of density and raciness, it also retains considerable freshness. 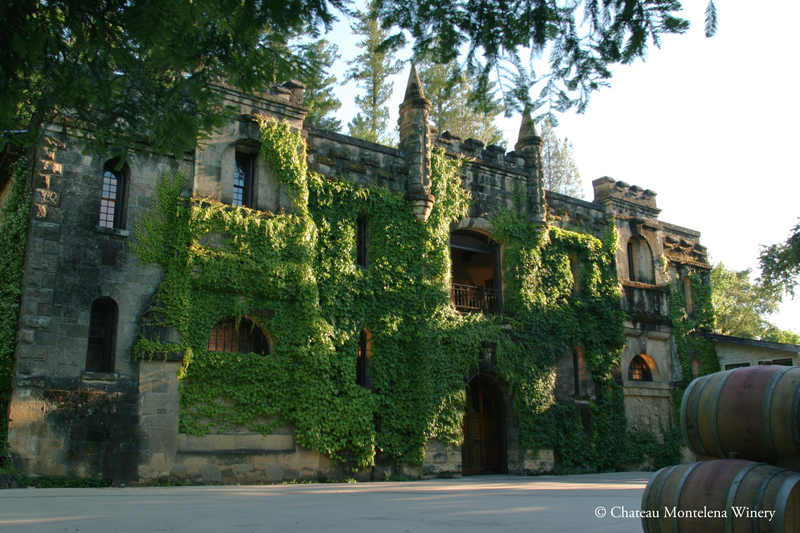 This is another drop-dead gorgeous wine from Chateau Montelena."